You've found the “U.S. Pineywoods Cattle Breeders” page here at Hobby Farm Wisdom! If this is the first time you have visited our site: Welcome! 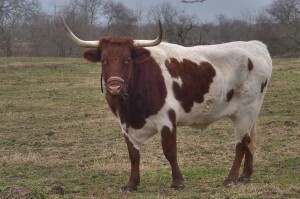 A “Heritage” breed, the Pineywoods is one of the oldest breeds of cattle in the United States originating from Spanish cattle left in the Gulf Coasts. They have evolved to become heat tolerant and naturally resistant to parasites and diseases. They are also distinguished for their fertility, ease of calving, gentle disposition, and longevity amongst the other heat-tolerant breeds. The Pineywoods are known to graze but they’re also able to forage on rough vegetation including brush, tree leaves and twigs. This characteristic deems them as “dry land” cattle which make an efficient use of the land. They also have low impact on the environment by spending minimal time at their water source; this reduces bank erosion and contamination of streams. In appearance they are small and bony, cows weighing between 600-800 lbs, and bulls 800-1,200 lbs. Most have curved and twisted horns varying from small to medium in length. They include most of the solid colors and a variety of spotting patterns according to the different family strains. Pineywoods cattle have been used for beef productions and occasionally as dairy cattle.